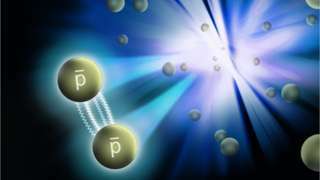 "Arafel": "Strong Forces Make Anti-Matter Stick" BBC Science: What to what? "Strong Forces Make Anti-Matter Stick" BBC Science: What to what? Quote; "Physicists have shed new light on one of the greatest mysteries in science: Why the Universe consists primarily of matter and not antimatter. Using a particle smasher called the Relativistic Heavy Ion Collider (RHIC) at Brookhaven, physicists were able to measured the force of interaction between pairs of antiprotons - the antimatter "mirror image" of the proton particle (which is one of the abundant building blocks of the Universe).
" Post to MediaLens message board (subject to edit at author's discretion).